Chat live with an online sales associate to help answer your questions. A new generation of workers is “adulting.” You’d better get to know what they want—your talent pipeline depends on it. Move over Traditionalists, Boomers, Gen X, and Millennials – a new generation is about to enter the workforce and employers better be ready. 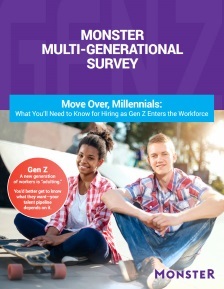 As the first wave of Gen Z college graduates search for full-time employment– employers will find multiple generations working side-by-side, changing the face of the workforce as we know it. Today’s employers need to pay close attention, as employee turnover rates are returning to pre-recession levels and Gen Z will soon outnumber Millennials and Boomers. More self-reliant, technologically-savvy and ambitious than previous generations, Gen Z has characteristics that will become extremely valuable to employers. The game is on for how to attract, retain and recruit this new generation of talent. To help employers stay ahead of the curve Monster, together with global research firm TNS, embarked on a survey of more than 2,000 people, across generations, to figure out just what it takes to attract this Snapchatting, smartphone addicted, Pokemon Go-ing generation. One thing is for sure – they’re no Millennial copycats. This generation is bringing new career, communication and work-life expectations to the workplace. Download this free report to get a leg up on what it takes to compete for the next generation of talent.